Hello dear FAE readers – This email is for your information with regards to how we collect and store your data. Yup it’s that General Data Protection Law (GDPR) that we are required by UK/European law to tell you about. 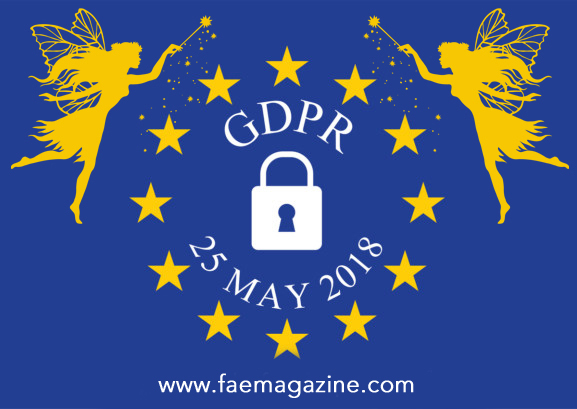 Here at FAE Magazine etc, we have always been committed to keeping your personal data safe and secure, and the GDPR does not change our commitment to you and your privacy. We have never, nor will we ever, pass on any of your details on to a third party. So you can rest assured that your email and details are safe in the hands of the fairies. If you’d like to stay with us, you don’t have to do anything, you will still receive our newsletters. You also have the right to unsubscribe for any of our emails by either scrolling to the bottom and clicking “Unsubscribe” or just send us an email to info@faemagazine.com and we can do it for you.